A Skoltech-led team of international scientists has developed a mathematical model that makes sense of one of the great mysteries that have long perplexed researchers of Saturn’s rings, and published the results of the research in the scientific journal Physical Review Letters. The rings of Saturn – formations of dust and ice that swirl along the planet’s equatorial plane – exhibit extreme instability, particularly the F-ring, one of its outermost rings. The F-ring has been known to change over the course of days or even hours: spacecraft have detected clumps of matter in the F-ring that have then suddenly disappeared. 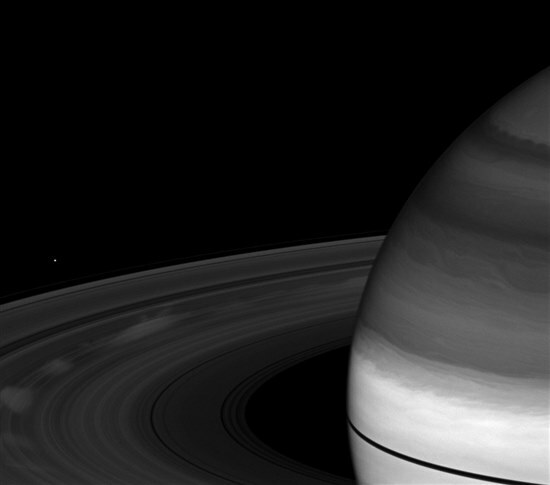 Massive, bright clouds of tiny ice particles hover above the darkened rings of Saturn in an image captured by the Cassini spacecraft around the time of Saturn's equinox. Photo: NASA/JPL/Space Science Institute. While it is not yet known what causes this erratic behaviour, it is known that the processes of particle aggregation (fusion) and fragmentation (decay) play a role in them. In planetary rings, such as those of Saturn, these processes occur on a particularly large scale, necessitating a consistent balance between fragmentation and aggregation. Scientists from universities in Russia (Skoltech, Moscow State University, the Institute of Numerical Mathematics of the Russian Academy of Sciences), the United Kingdom (the University of Leicester), and the United States (Boston University) teamed up to shed light on the mysterious F-ring with the help of a mathematical model that had previously been used to study Saturn’s more stable elements. Using the model, the Skoltech-led team demonstrated the possibility of ceaseless periodic oscillatory regimes for particle fusion and fragmentation within Saturn’s rings. In other words, they have identified a mechanism that could cause the formation of clots in a planetary ring such as F-ring. Their findings satisfy the law of mass conservation, which holds that mass cannot be created or destroyed in chemical reactions. “We spent nearly three years working on this before presenting our results for publication. This is because it took us a great deal of time to work through our doubts and the validation stages,” said lead author and Skoltech research scientist Sergey Matveev. “In the end, we found an example of a never-ending periodic oscillatory solution from the mathematical model of the aggregation and fragmentation processes of Saturn’s rings. Furthermore, we determined that these periodic regimes lead to a stable limiting cycle, which is very surprising for a model under the mass-conservation law, where stable equilibrium solutions are expected to be found,” said Matveev. As the main results come from numerical simulations, the team of scientists now hopes to attract interest from the mathematical community for the elaboration of rigorous analytical proofs of the presented phenomena, said Matveev. “In any case, we infer that these results may shed some new light on the phenomena of periodic clumps arising in the F-ring of Saturn,” he said. The rings of Saturn were first spotted in 1610 by Galileo Galilei. At the time, he believed they were part of the planet itself. In-depth study of the formations only became possible in the 20th century, in the era of space exploration.